Sorority recruitment is an exciting yet often stressful time of year. Your main focus should be on finding the perfect new members for your sorority and forming friendships that will last a lifetime. However, with numerous potential new members to get to know and a full schedule of recruitment activities to plan and attend, staying organized can be a challenge! Let’s take a look at what makes these sorority recruitment software providers stand out so that you can make the right decision for your chapter and have the best recruitment yet! To find the best new members for your sorority, you want to be able to collect, analyze, and share as much information on your PNMs as possible with your voting members. Our top pick, OmegaFi, is a sorority software option that provides multiple ways to organize and share your PNM data as well as a mobile app to add important information on-the-go. Add tags and additional information to PNMs as they learn it. When your members do this, they’re also updating your PNM database to include all details relevant to voting. View reports and your PNM slideshow. This way, all of your members can access and review essential information prior to voting. Keep track of recruitment activities and events. Your members can use the app to stay up-to-date and minimize stress throughout recruitment. Vote on new members. When it’s time for your members to vote, the app is the most convenient way to complete the process! 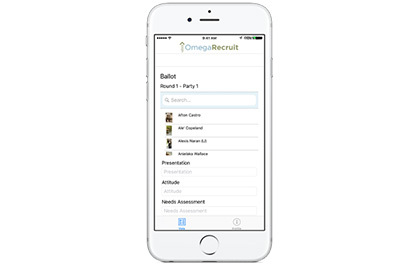 OmegaFi’s sorority recruitment software provides your voting members with convenient access to your most comprehensive and recently updated PNM data and facilitates every step of the recruitment process from events to voting. When your sorority is evaluating many PNMs, it’s essential for you to be able to find and organize the information you need quickly. OmegaFi’s Chapter Hub allows you to access all your PNM data in one place and organize information according to customizable categories. 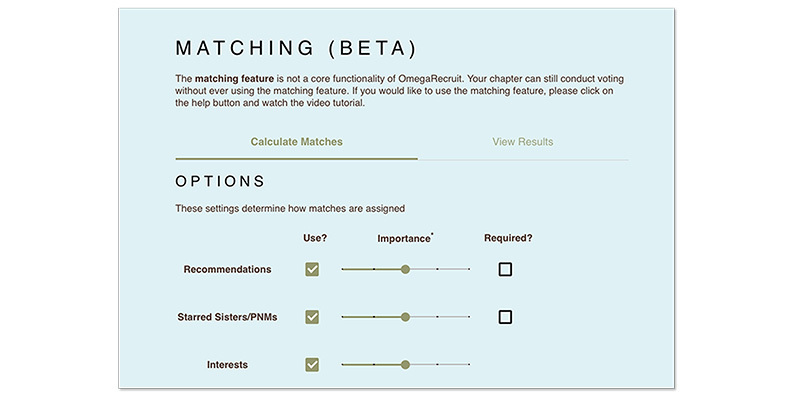 Within Chapter Hub, your members can create and apply tags to PNMs indicating positive qualities, such as legacy status or a history of involvement with your sorority’s chosen philanthropic cause, as well as risk factors, such as a weak academic record. You can then sort your PNMs according to these custom categories. To share the most relevant PNM and voting information with your other voting members, you can create graphs using selected data. These visual representations are valuable for understanding the data and observing trends both before voting and after the votes are in. You can also use the software to generate statistical analyses to better understand voting trends. Matching your PNMs with current members of your sorority for conversation is an essential component of a successful recruitment, as this process can help you determine who among your PNMs are the right fit for your sorority. However, matching can be time-consuming. OmegaFi’s Matching feature saves you time by making the process collaborative, allowing your voting members to submit suggested matches when they vote on PNMs. The Matching feature can also generate potential matches for your PNMs using your pre-existing sorority management system data, providing additional direction so that you can be sure you’re making the perfect matches. To make the best decisions regarding new members for your sorority, all of your voting members need to be well-informed about your PNMs before casting their votes. OmegaFi’s automatically generated reports make it easy to share key information about your PNMs before your members make their decisions. 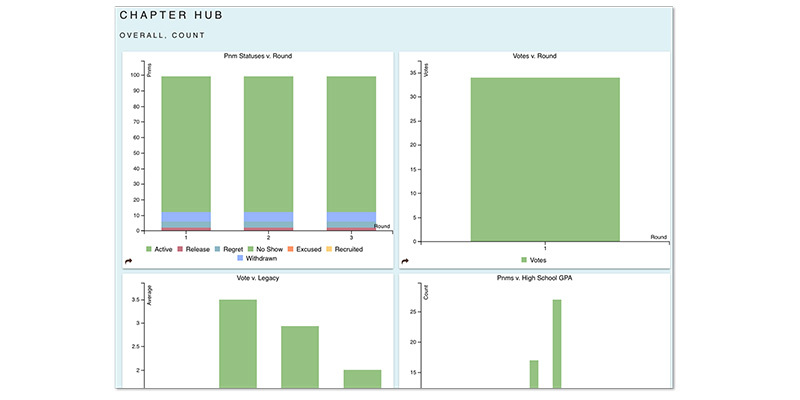 OmegaFi generates reports on PNM data, suggested matches, and your members’ comments on PNMs to inform your vote. After your chapter has made your decisions, you can use the votes report as an overview of this year’s recruitment and compare it with past years’ reports to observe recruitment and voting trends. Ensure that all of your PNMs are prepared to vote by sharing the most important information on your PNMs using OmegaFi’s Slideshow feature. Because your sorority recruitment software automatically generates this slideshow, you won’t have to spend time manually inputting PNM data into PowerPoint or a similar program. Your PNM slideshow is created from the information in your database and includes the tags your members have added to your PNMs. To make sure that your voting members are seeing the most important information in the slideshow, a member of your chapter serves as the slideshow admin. For members who want to reference the PNM slideshow from wherever they may be, they can access it using OmegaFi’s sorority recruitment and voting app. If your sorority already uses ICS (Interactive Collegiate Solutions) as your sorority management platform, OmegaFi’s recruitment software integrates with ICS so that you automatically receive previously created PNM lists. Your PNM list is bound to change as you progress through the various events and rounds of recruitment. If your chapter is using ICS in addition to OmegaFi to keep track of changes to your original PNM list, these changes and updates will also be reflected in OmegaFi. 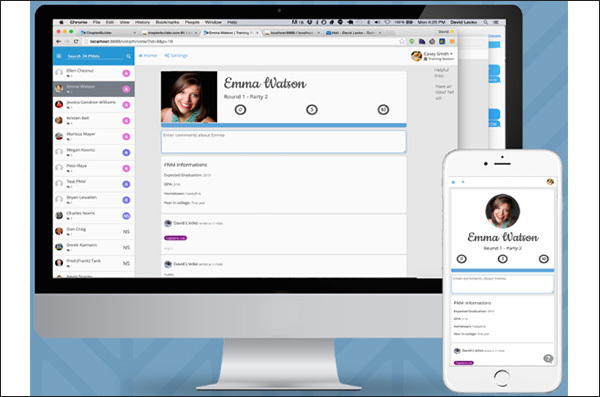 OmegaFi is our top choice for sorority recruitment software because it has all the important features we’re looking for, so your sorority can manage recruitment easily using this single comprehensive system. Larger sorority chapters have special considerations when it comes to choosing the right sorority recruitment software. Your chapter is looking for a comprehensive solution that’s easy to operate, affordable, and can help you find the best new members out of a large pool of PNMs. With TechniPhi, your large chapter can manage recruitment activities and identify the perfect new members for your sorority. CampusDirector. CampusDirector, TechniPhi’s online recruitment tool, integrates with TechniPhi’s membership selection and year-round recruitment management software to provide your chapter with a comprehensive recruitment solution. Both your chapter and your PNMs can use different features of CampusDirector to navigate the recruitment process. On your chapter’s side, CampusDirector allows you to register for recruitment events and invite PNMs to them. Need more information on your PNMs? CampusDirector can integrate with your college or university’s single sign-on platform to ensure you have the necessary data. While TechniPhi offers the PNMCompanion app for your PNMs, there’s no voting app for your chapter to use during recruitment. ChapterBuilder. Looking to expand your chapter but need some help finding the right new members out of large groups of PNMs? TechniPhi’s ChapterBuilder automatically suggests PNMs for your chapter and adds them to your list so that you can be sure you’re reaching out to all PNMs whose interests and values align with those of your sorority. Need help staying on track? ChapterBuilder offers assistance in the forms of performance tracking reports, automated alerts, and the virtual coach feature. MyVote. When it’s time for your voting members to decide who among your PNMs are the perfect fit for your chapter, TechniPhi’s MyVote simplifies the process. MyVote is customizable to your chapter’s voting criteria, so your voting members know exactly what they’re looking for in each PNM when they vote. It syncs with CampusDirector and ChapterBuilder so that everyone will have all the data they need. Most effective when chapters choose to use all three components that the platform offers (CampusDirector, ChapterBuilder, and MyVote), TechniPhi is an easy-to-use software solution for larger or growing chapters to consider. Although your chapter likely considers voting the most important component of the recruitment process, recruitment events are essential for introducing your chapter to the right new members and helping PNMs find the right sororities for them. GreekLink is a software solution that can help your chapter plan and carry out the perfect event. Event registration. With GreekLink, you’ll easily be able to register and check in event attendees. Want to know who registered but didn’t show up, or which events were your most popular this recruitment season? GreekLink’s analytics feature provides you with this information so that you know how to reach out to your PNMs most effectively. User profiles. One of the main purposes of your recruitment is to help your chapter get to know your PNMs better. GreekLink allows you to create user profiles on your event attendees, adding more information as you interact further with your PNMs. 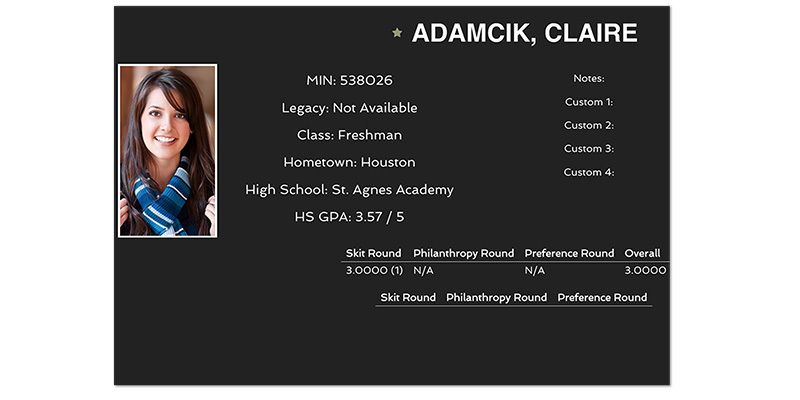 The user profiles include each PNM’s picture, helping your members put names to faces for future events. Event feed. 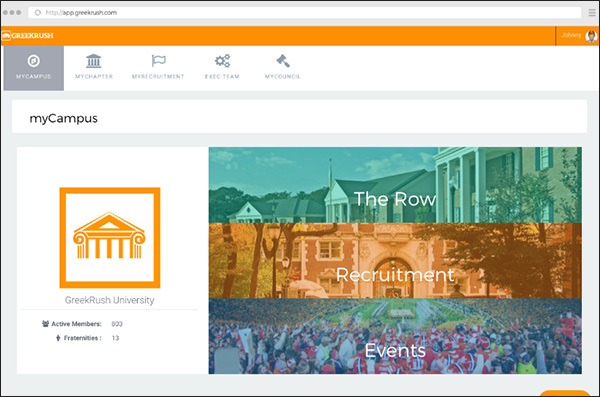 GreekLink gives you access to an Event Feed dedicated to recruitment, where you can create, promote, and track the progress of your events. To make sure that everyone you want to invite to your recruitment event is reminded about it, you can send an automated email to all the guests you’re anticipating. Your chapter’s profile is customizable so that you can share your sorority’s goals, interests, and values, helping you attract the right PNMs to your events. GreekLink is a strong solution for recruitment event management, though unfortunately, it does not offer a mobile app. OmegaFi’s Fast Facts About Sorority Finances: After you’ve selected your newest members, learn how you can manage your sorority’s finances throughout the year. Double the Donation’s Top Fraternity Management Software: Looking for a way to keep member data more organized and accessible? Check out this list of top fraternity and sorority management software to connect with current members and alumni more effectively. What Are Sorority Dues? : As your new members pay their dues for the first time and you embark upon another year of successful financial management for your sorority, answer any questions your members may have with OmegaFi’s guide to sorority dues and their purposes. Retired Fundraiser. Active Dog Owner. Up and Coming Chef. Always searching for the next big thing in nonprofit technology and software.